Being a first-time mom, I am excited every time my son is reaching his month-to-month milestones for his development. I can’t help but be delighted to know how far I've been with motherhood, him being cuddly and cute now turning 8 months; my raucous baby is learning how to crawl. From 6 to 12 months, there are two important skills that are being developed to your baby: crawling and walking. These motor skills make it possible for him to move around and explore new grounds and will prepare him to further development. It is imperative, therefore, to childproof your house during this crucial stage as a precautionary measure to prevent your infants from physical injuries rather than waiting for your baby to be completely mobile before doing so. Since you now have an explorer in your hands, let’s start preventing household hazards. 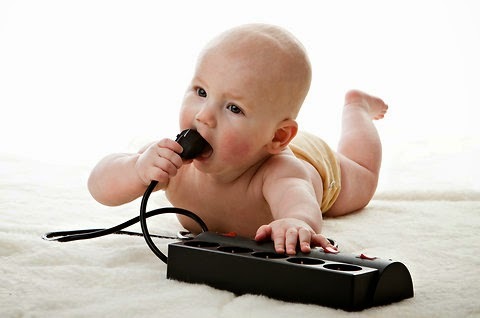 1.Keep the electrical outlets hidden, or have them in safety covers to avoid babies from sticking their fingers which cause shock or burns. 2. Water containers should be with covers. Keep the babies away from bathtubs if you will be gone for minutes. Be mindful of your comfort room to prevent your baby from slipping or even drowning. 3. Secure your kitchen cabinets. Make sure that knives and any pointed objects are well hidden. Place all kitchen and other household chemicals like bleaching solutions in the farthest side as well beyond his reach. 4.Be keen with small objects that he can pick and swallow. Most of it is from toys with small parts like buttons, screws and any other choking hazards. 5.Check for any cords, strings or any items that can cause strangulation. 6. Remove unsteady or wobbly pieces of furniture to prevent your baby from falling. 7. As much as needed, carpets and rugs are secure as they can cause slips. Table edges and cabinets can knock or cause bumps to your children once they hit it so try to childproof them too. There shouldn't be any obstacles that might block his way especially if your baby is quite mobile already. There is no oops in rearing a child! No room for errors. According to kidshealth.org “Household injuries are one of the top reasons kids under age 3 visit the ER, and nearly 70% of the children who die from unintentional injuries at home are 4 years old and under. Young kids have the highest risk of being injured at home because that's where they spend most of their time.” Always secure your baby! Jessie Corpuz-Dericto, 28 years old is a Freelance Writer,Blogger, Virtual Assistant and a nursing mom. She is also into news and trends, fashion, photography, painting, and sketching. She loves sensible talks, long walks and activities that will enrich both the mind and soul.